We finally have the pricing and final itinerary for our St. Paul Mediterranean Cruise & Pilgrimage this Fall. We will visit 10 biblical sites related to St. Paul, St. John and the Blessed Virgin Mary – not counting the post-cruise pilgrimage through Rome. Athens, Corinth, Philippi, Thessaloniki, Berea, Kavala (biblical Neopolis), Ephesus, Island of Patmos, Rhodes and Crete. All of these sites are mentioned in the New Testament. We will have Mass at Mary’s House in Ephesus, outdoors where Paul was tried in Corinth, in the Cathedral of Thessaloniki, at the River Zagatis in Philippi where Paul baptized his first European convert Lydia and more. See our website HERE and the brochure HERE. The majority of our group arrived at 1:30 PM at the Athens International Airport. Quick tour of Athens before climbing the Acropolis to see the Parthenon. My favorite place in Athens is Mars Hill (Aereopagus) which is mentioned in the Bible, book of Acts chapter 17 where St. Paul gives a presentation to the Aereopogites. Fascinating passage where St. Paul teaches us how to evangelize our own current age. Then Mass at the Cathedral of Saint Dionysius, first bishop of Athens (Acts 17:35). You can hear/see the homily here. Then we walked to a delicious dinner and checked into our hotel. Enjoy! St.Paul lived here for 18 months and wrote them at least three letters. It was an immoral city and in literature to “corinthianize” meant to corrupt. A “Corinthian Girl” was a harlot. Paul has a big job to do here! Beautiful weather, great folks, unique outdoor Sunday Mass (homily here) — a banner day! Today is one of my favorite days of the cruise along with Corinth which we visited two days ago. Today we visit Ephesus where Paul lived for two years and where the 4th Ecumenical Council took place. We start our time in Ephesus by going to Mary’s House on the side of the mountain. She lived here for a period of time while St. John was the Bishop of Ephesus. We had Mass at Mary’s House. You can listen to Fr. Gregory’s excellent Marian homily here. Then, after a free afternoon on the ship, we arrived in the evening to the Island of Patmos where St. John was exiled because of the gospel and his testimony of Jesus Christ. The Book of Revelation was written while he was on this island. We visit the cave where he lived during his stay here. Video 1 is Ephesus and Video 2 is Island of Patmos. Enjoy! Rhodes is a biblical site mentioned in Acts 21:1 where St. Paul stopped on his 3rd Missionary Journey. Private Mass at Santa Maria Catholic Church in Ialysos, Rhodes and you can hear the homily here. I was able to make the arduous climb all of the way to the top of the acropolis with about 12 others in the pouring rain and the wind blowing hard enough to knock you off the mountain so that I can get pictures of the port of St. Paul where he arrived 2000 years ago. We took a tour of ancient Rhodes in the archaeological site on our way back to the ship. Return to the ship for lunch and a free rest of the day. There’s a lot to do on the ship and people are enjoying themselves. I also gave my talk “The Life and Ministry of St. Paul” at 5:00 before we had dinner. Enjoy Rhodes! Today we landed in Heraklion in Crete, Greece’s largest island. According to Greek mythology it was the birthplace of Zeus, the head of the gods. But for us, the most important thing is that St. Paul was on this island at least twice and established the church here. He later left Titus on Crete to put things in order and to appoint bishops. We started off with Mass at St. John the Baptist Catholic Church. It’s always a challenge to find a Catholic Church because this country is almost exclusively Greek Orthodox. You can hear/see Fr. Gregory‘s excellent homily here. We then toured the archaeological site of Knossos. After our time on the island of Crete everyone had a whole afternoon free to nap, go to the ship’s shows or any of the other activities that are available on the ship. In the late afternoon at 4:30 PM we landed at the island of Santorini where most everyone disembarked to experience this beautiful and exotic Greek island. The ship departed at 9:30 PM and we’re heading back to Athens. We disembark the ship at 7:00 AM gathered our luggage and boarded the bus for downtown Athens. Everyone had 3 to 4 hours of free time to enjoy the restaurants and shops and ambience of this ancient city. 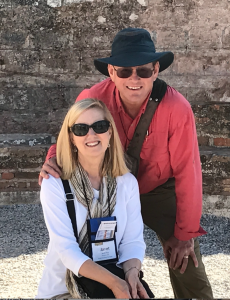 We boarded our plane and headed on the short flight to Thessaloniki after which we boarded our bus and did a tour of this biblical area in northern Greece. We had Mass at the Thessaloniki Cathedral of the Immaculate Conception. You can hear/see Fr. Cole‘s homily here. After a good dinner at the hotel will be nestled in for the night ready to visit Philippi tomorrow morning. Enjoy! We drove just under two hours to Philippi from our very nice hotel in Thessaloniki. We have two sites to visit today which are both related to St. Paul. The first is Philippi where we will tour of the ancit site and see the prison where Paul and Silas were chained (Acts 16). Will also have Mass on the river where he baptized his first European convert named Lydia. Fr. Gregory’s homily. Then we visited Kavala which is the modern name of ancient Neapolis where Paul first set foot on European soil. We then flew back to Athens for a very short night before everyone flies home or to Rome or other destinations. It’s been a great pilgrimage! These videos will continue with the contingent that is going with Janet and I for three days to Rome. Watch the entire full length pilgrimage video below. You can also download it in HD here. We visit 9 biblical sites following St. Paul, St. John the Evangelist and the Blessed Virgin Mary. 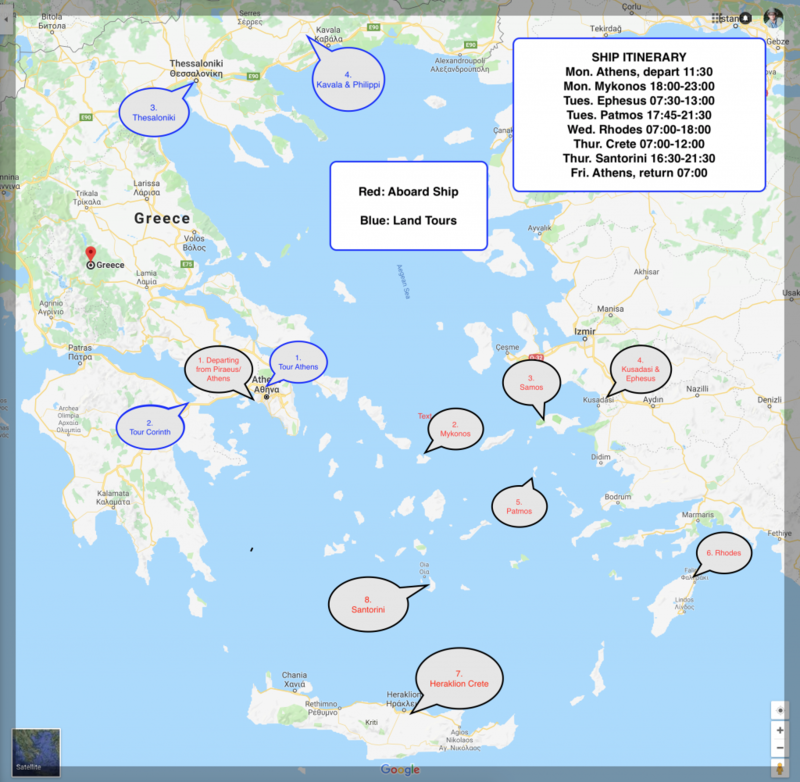 These are the biblical sites (not counting other islands and cities): Athens, Corinth, Thessaloniki, Kavala (Neapolis), Philippi, Patmos, Rhodes, Crete, Ephesus and with the extension, Rome. Prices vary due to the cabin you choose if you want the Rome Extension and other factors. Phone: 866.468.1420 Fax: 313.565.3621 E-mail: elizzio@ctscentral.net. Steve and Janet Ray are with the group every step of the way. 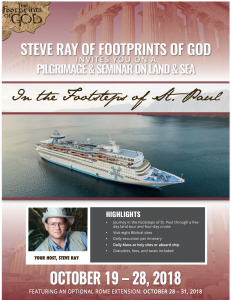 Steve will be giving his talks at the sites and be guiding you through the Bible. Our local guides in each city will provide the local history and color. Daily Mass and great meals. Fellow-minded, enthusiastic Catholics and several great priests. One of the priests is Fr. Robert Cole from St. Katharine’s Parish in New Hampshire and the other priest is Fr. Gregory Plow TOR from Franciscan University of Steubenville. Depart USA on overnight flights to Greece. EPHESUS: Drive through the colorful town of Kusadasi to Ephesus and arrive at Mt. Koressos. We will visit the House of the Virgin Mary where she lived while St. John was the bishop of Ephesus. Next our guided tour of ancient Ephesus will take us meandering through one of the most magnificent ancient excavations in the world. See the Odeon (concert hall), the Fountain of Trajan, the Temple of Hadrian and the stone-seat latrines and the Library of Celsus (where we will take a group picture). Steve will give short talks at both the “ancient brothal advertisement” and The Great Theatre with 24,000 seats. We will also see the ruins of the Church of the Virgin Mary where the Third Ecumenical Council of the Church declared Mary to be the “Theotokos,” the Mother of God. Steve will explain why that is so important. Mass on the ship between stops. Mass at hotel for those returning to USA to fulfill Sunday obligation. After breakfast at the hotel, transfer to airport for return flights to USA.